Together in one special volume, selections from the best of beloved bestselling author C. S. Lewis's classic works for readers contemplating the "grand miracle" of Jesus's resurrection. Preparing for Easter is a concise, handy companion for the faithful of all Christian traditions and the curious to help them deepen their knowledge and consideration of this holy season—a time of reflection as we consider Jesus's sacrifice and his joyous rise from the dead. 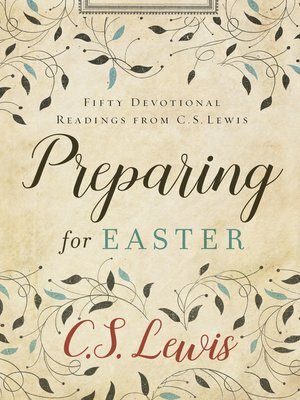 Carefully curated, each selection in Preparing for Easter draws on a major theme in Lewis's writings on the Christian life, as well as others that consider why we can have confident faith in what happened on the cross.